Isatou Ceesay came to the United States in 2015, 2016, and 2018 for very special tours and events with author Miranda Paul and/or illustrator Elizabeth Zunon. If you missed the opportunity to meet her, you can request a new tour, school visit, or speaking engagement by getting in touch with booking assistant Judy Cooper through this contact form. 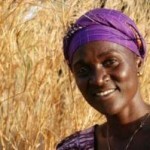 You can also virtually *meet* Isatou Ceesay and recycling women of the Gambia through several YouTube videos. Please note, the documentary linked here extends far beyond the content of the book. It contains images and addresses subject matter that may not be appropriate for young children. Please evaluate the video first before sharing with your students. If you’re planning a trip to the Gambia, West Africa—you’ll have the unique chance to meet the women of Njau and stay in the village. 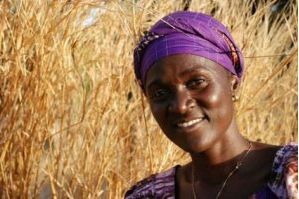 Click here to download a tourist brochure with more information about visiting the women’s fair trade cooperative in Njau, Gambia. Miranda Paul (author) also travels to schools, churches, and conferences to share the twelve-year story behind the making of One Plastic Bag: Isatou Ceesay and the Recycling Women of the Gambia. She’ll engage your attendees as she helps them explore aspects of Gambian culture and introduces them on a more specific level to life in Gambia. Download Miranda Paul’s school visit information packet online here. Furthermore, there are several additional videos and documentaries linked on the home page of One Plastic Bag where you can hear Isatou’s message directly from her, as in this BBC Africa story.